The pony wars are heating up. For the first time in decades, the reborn Chevrolet Camaro is outselling the Ford Mustang. But neither maker seems ready to settle in and accept the status quo. While Chevy hopes to increase its appeal with the long-anticipated Camaro Convertible, Ford is putting a premium on performance hoping to out-muscle its cross-town competition and regain its position as pony car king-of-the-hill. Ford pulled a rabbit out of its corporate hat at the Los Angeles Auto Show, revealing an all-new V6 pumping out an impressive 305 horsepower – and, equally impressive, 30 mpg on the highway. 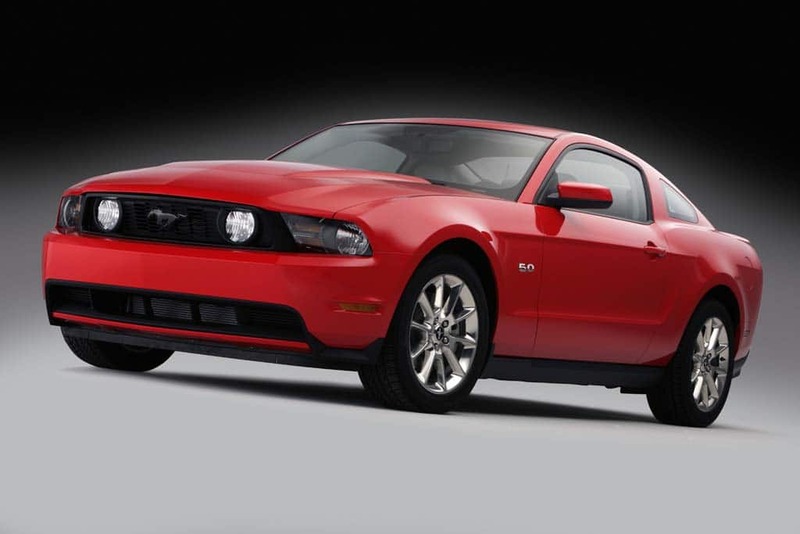 Not all that long ago, that would have been a solid figure for the bigger, V8-powered Mustang GT. So, with that in mind, the automaker is pushing into what, not that long ago would have been supercar territory, the 2011 Ford Mustang GT –which debuts at next month’s Detroit Auto Show — will pump out a solid 412 horsepower and a tire-spinning 390 pound-feet of torque. Consider that the 1995 Mustang GT, which heralded the return of V8 power, made what was, at the time, the seemingly impossible 215 horsepower. 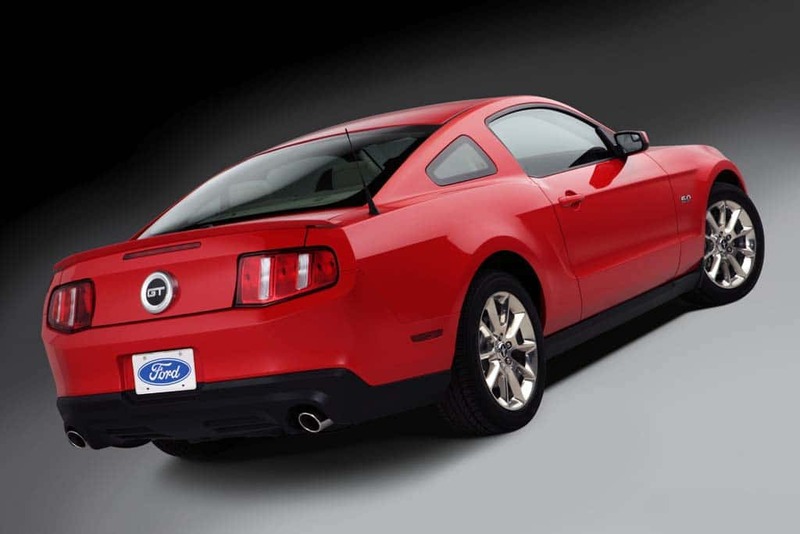 When the pony car was switched to the 4.6-liter eight-banger, in 1995, the numbers jumped to 300 hp and 320 lb-ft. The all-new 5.0-liter Ford V8 turns out 412 hp and 390 lb-ft of torque, while still delivering an estimated 25 mpg on the highway. While Detroit has often lived by the mantra that “bigger is better,” that’s not necessarily the case, these days. There’s a concerted push towards smaller engines using alternatives means to boost both performance and fuel economy. Ford’s very own Taurus SHO is a great example, its V6 pumping 365 horsepower out of just 3.5 liters using twin turbocharging and direct injection. But there are times when they really is no replacement for displacement, or so Ford is betting with the naturally-aspirated 2011 Mustang GT. Not that this is your classic chunk of cast iron. The new pony car’s powertrain is a Dual-Overhead Carm, 32-valve all-aluminum design with Twin-Independent Variable Cam Timing. The newly-designed heads use new, compact roller fingers and a slick tuned composite intake manifold. 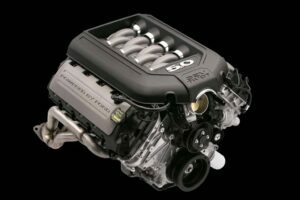 “The heart of the engine is in the breathing,” contends the 5.0-liter’s chief engineer, Mike Harrison. Time was when horsepower was all that mattered to pony car fans. These days, muscle has to be matched with agility. While we’ll have to wait to make our own judgment, Ford is clearly taking what appear to be some of the right steps. Though the look of the 2011 Ford Mustang GT will be familiar, the pony car gets a new E-PAS steering, upgraded suspension, optional Brembo brakes - and the 5.0-liter V8. It’s upgrading key suspension components on the 2011 Mustang GT, and it’s switching to a rack-mounted electric power-assist steering systems, or E-PAS, on the ’11 model. Company officials claim that will yield more precise and responsive handling and better road feel. E-PAS also yields better fuel economy by reducing the frictional losses of a conventional hydraulic power steering pump. Braking power is as important as horsepower and for those looking for maximum stopping capability, Ford will offer optional Brembo brakes on the 2011 Mustang GT, along with a 19-inch wheel package. We’ll have to wait for pricing, though considering the tough battle Ford has found itself facing, we expect to see the maker hold close to the current numbers for the base GT, in the $35,000 range. Barring some last minute mathematical miracle, the Chevrolet Camaro is expected to grab the top spot in the pony car sales sweepstakes for 2009, the first time that has happened in decades. For their part, Ford officials try to minimize the pain and agony this is causing. They insist they don’t really care who’s first, but it’s hard to take that as much more than rationalization. 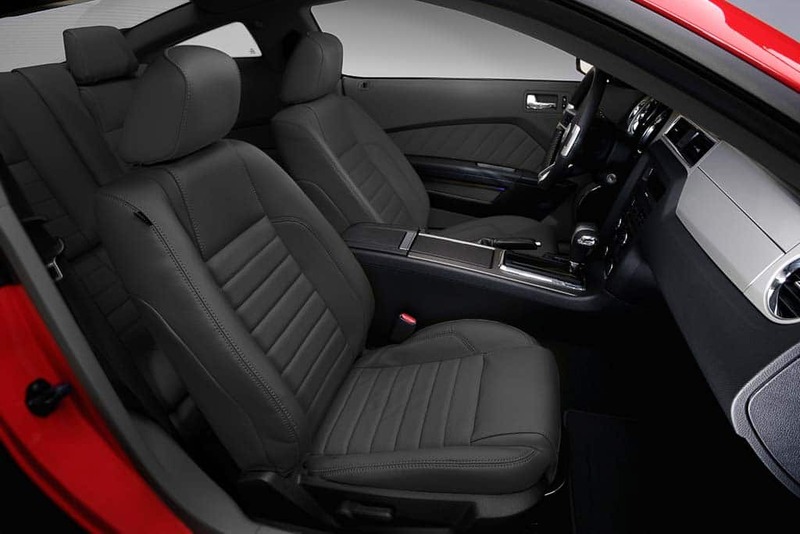 Ford has upgrade the interior of the Mustang noticeably in recent years. That’s not entirely untrue, but be sure that Ford will do everything it can to win back some of those buyers who might be considering Camaro in the years ahead. The new 5.0-liter engine will be a big draw. But in reality, the GT is likely to remain a distant second to the V6 in overall Mustang sales. But when you add them both together, they give Ford something to crow about.